The wind is HOWLING out of the south in Hayden, Alabama. 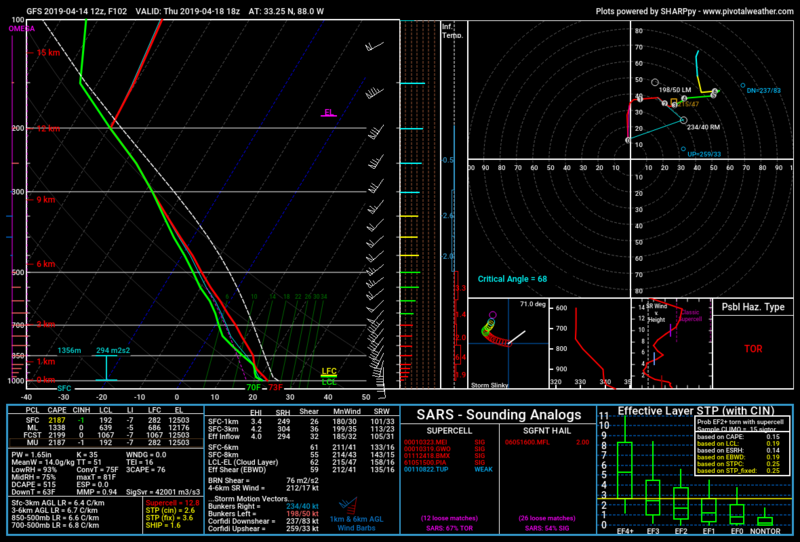 West Al sounding Thursday, check out the analogs. How are you currently feeling about this set up as you see it right now. Obviously things will get fine tuned as we get closer. I was just curious if your thoughts..
thats actually not the primary slp am I correct...? And that slp over Tennessee valley on the euro would be a secondary slp? lots to be figured out at this point, but some of the models runs I have seen look very concerning. Assuming there isn't an issue with instability, I think the key is the 2nd vort max diving in. If it is slow enough it will cause the trough to become more broad based...opening the door for a large wide warm sector with plenty of expansive mid level shear....if there is low level shear too, in some ways, a classic April outbreak setup for the mid south/dixie...but again, there are still a lot of unknowns to be figured out yet. That's a concerning look. I don't like that at all. 12z Euro is a dangerous look for the central Gulf states. I think it is underestimating surface temperatures (as a lot of synoptic models do at this range), It looks like it depicts a prefrontal trough/convergence axis and that is a concerning look, esp. this far out. Don't get too hung up on the surface low being pretty far to the north. Low-level winds are still backed way down in the warm sector, there are still significant surface pressure falls through the MS/AL/GA/TN portion of the warm sector, and the actual upper-level energy Thursday is more directly aimed here. To the thunderstorms, it still "feels" like the surface low is closer because of all that. They don't check the GFS, or Euro, to see what the surface low position is before they decide to rotate. We have had MANY outright violent tornado events over the decades here in Alabama with surface low positions a good bit north of what is considered that "classic" track from central Arkansas into Kentucky. Fred, you are right on...we have seen plenty of severe events with the sfc low centered well away..there are several ways to get strong pressure falls and backing winds without the low being in your backyard. The timing slowed considerably since I last looked at it. Previously, it was looking to be a Wednesday afternoon threat for Georgia, but now seems to be Friday morning verbatim. I'm flying Bham-ATL-San Francisco Thursday starting at noon, so it's going to be interesting either way. Maybe will get some interesting aerial views of supercells if I luck into a window seat. NWS Tallahassee Discussion mentions possible 'Outbreak'. the HWO Thursday afternoon and evening. This past system had 5.0-5.5 C/KM lapse rates and we were still able to manage ~1,000 J/KG SBCAPE in the dead of night. I'm not sure it'll be as big of a limiting factor as they believe. My concern is some backing of the winds in the mid levels if this amplifies anymore. But right now, this continues to be a substantial threat.